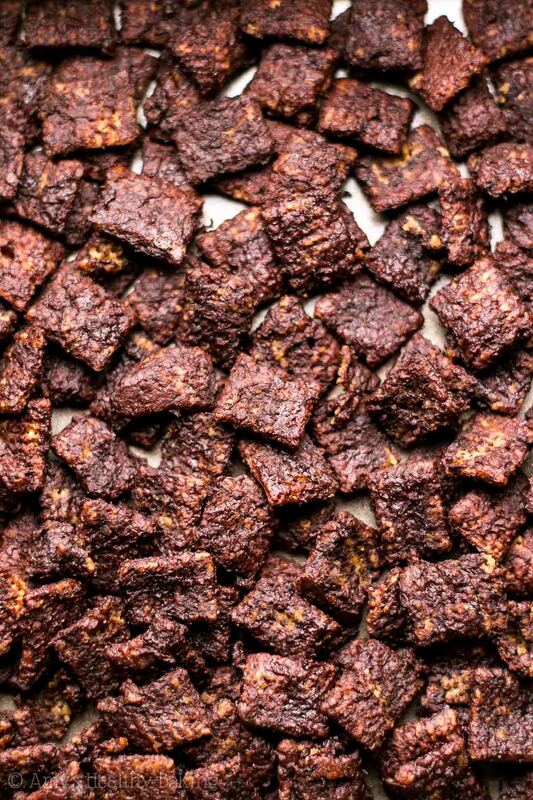 A healthier recipe for the classic chocolate-covered cereal snack. 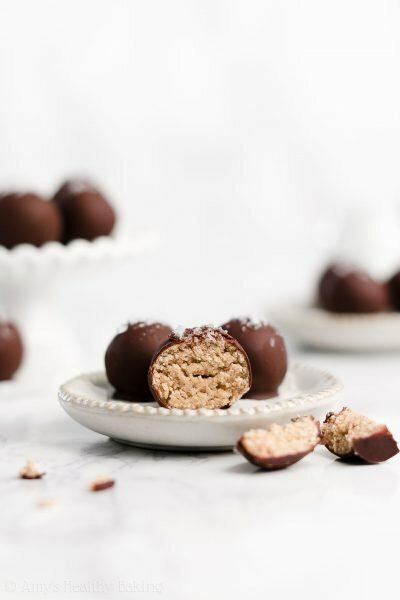 A secret ingredient gives it a big protein boost & makes it taste just as sweet as traditional recipes! A few weekends ago, one of my best friends from high school invited me to the movies to see “Zootopia.” Even though I knew nothing about the film’s storyline, I immediately agreed to go because we hadn’t seen each other since our last Starbucks coffee date before Christmas. Plus I love animated movies, especially Disney ones! After meeting outside the ticket office and exchanging many big hugs of excitement, we headed into the theater and found seats in the prime location, about halfway up and in the very center of the screen. Because we always arrive extra early, we spent the next half hour catching up while families filed in around us, and by the time the previews ended, the entire room was full of little kids. Good thing we’re both so short… We fit right in! When the credits started rolling two hours later, I felt so happy and lighthearted. The adorable main character, a little bunny named Judy, did an amazing job at passing along the uplifting message to continue following your dreams, even when everyone around you constantly discourages you and tries to convince you that you’ll fail… And that it’s entirely possible to prove them wrong while staying an incredibly sweet and generous person. Or, umm, rabbit. I won’t give away any more, but I definitely recommend seeing it—and I’ve already started a countdown of the days until I can buy it on DVD! Small forest green lawn chairs in the children’s section! With no kids nearby, we snagged the seats (again, being short and small helps—we fit perfectly!) and spent the next hour trading stories about the past three months of life while surrounded by picture books and beginners’ chapter books. That was the best rainy Sunday afternoon I’ve had in a long time! Because the theme of the afternoon seemed to be innocent childlike fun—first the animated movie, then the bookstore—I came home craving a special treat from my childhood. 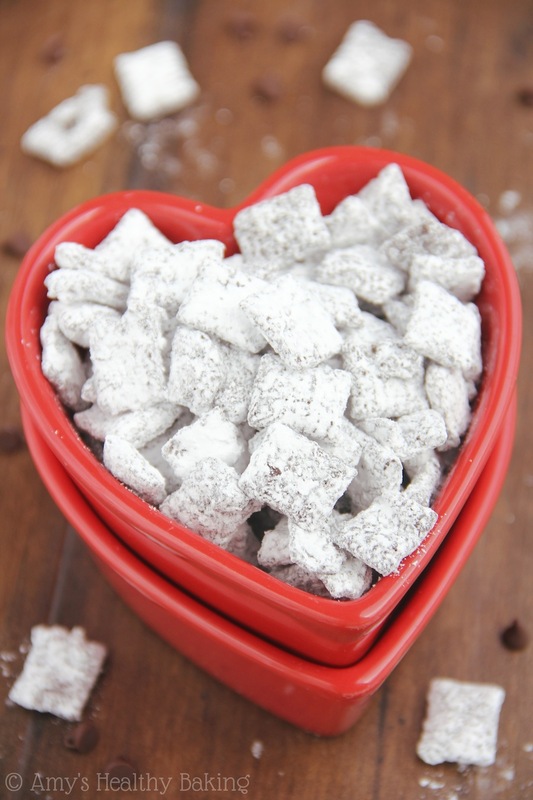 But because it’s me, I decided to make a healthier version, which resulted in this Protein-Packed Skinny Puppy Chow! 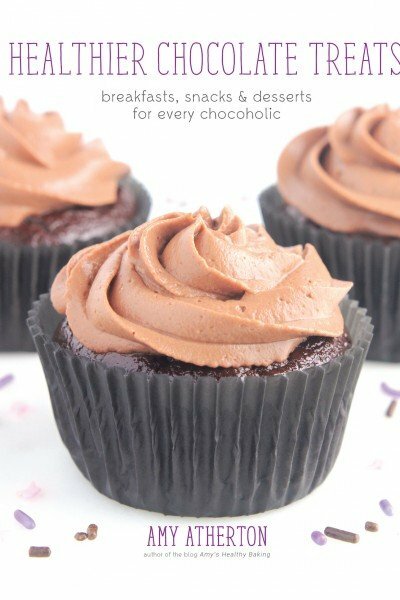 It has the same irresistible chocolaty flavor but none of the refined sugar—or guilt! 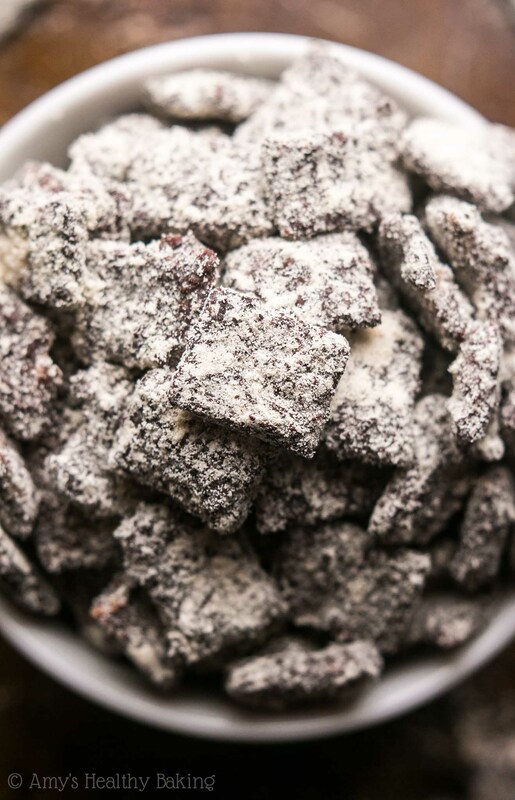 Most puppy chow recipes begin by combining melted chocolate and peanut butter, but… That’s a whole lot of calories for what’s supposed to be a “snack!” Instead, you’ll make a pudding-like mixture on the stove using milk, cornstarch (for thickening! 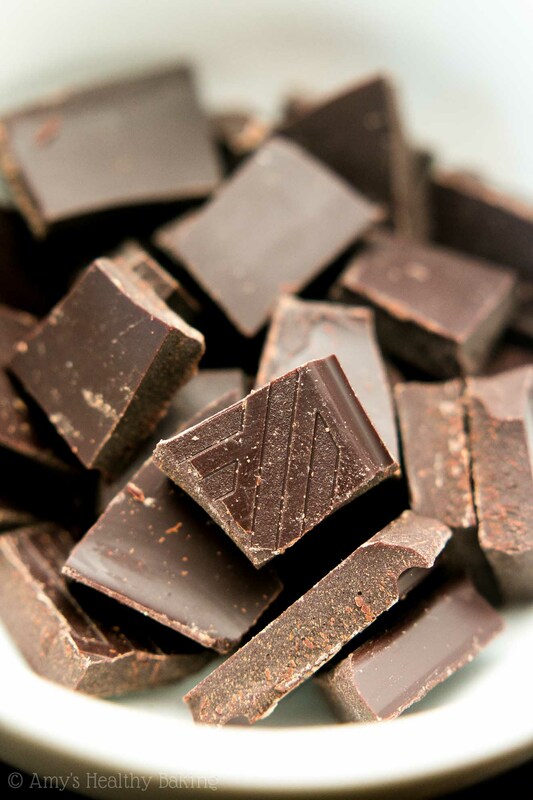 ), melted dark chocolate (although less than traditional recipes call for! ), and peanut flour. Protein powder! See? 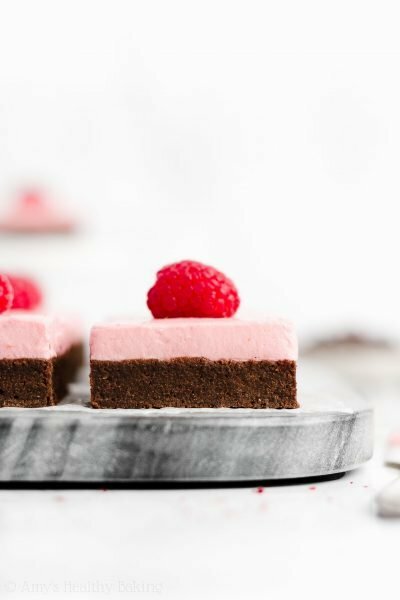 No need for refined powdered sugar! This is the vanilla protein powder that I used, and my taste testers couldn’t tell it wasn’t powdered sugar! 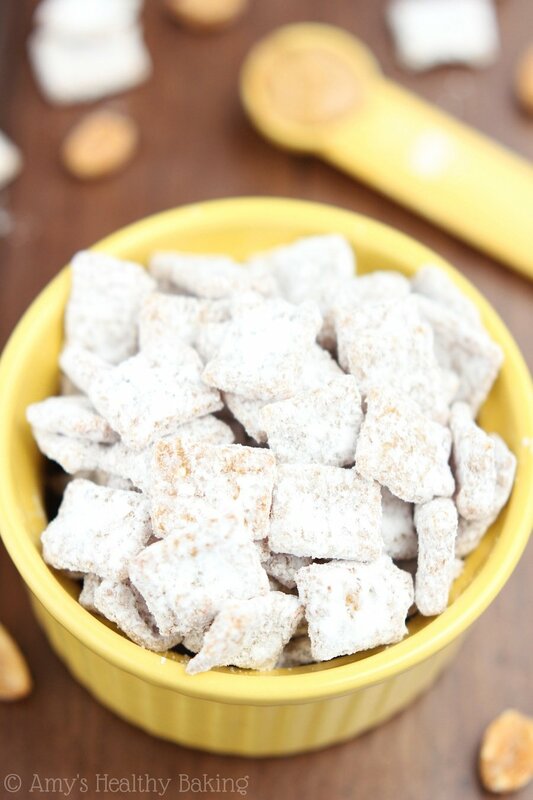 They said the muddy buddies tasted just like traditional recipes—sweet, crunchy, and absolutely irresistible. Snack time! 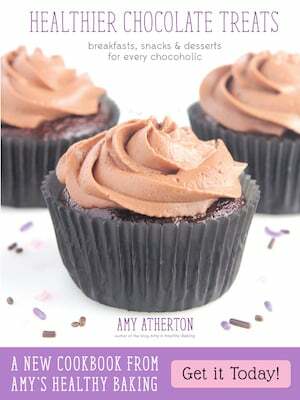 And when you make your own, be sure to take a picture and share it on Instagram using #amyshealthybaking. I’d love to see your puppy chow! 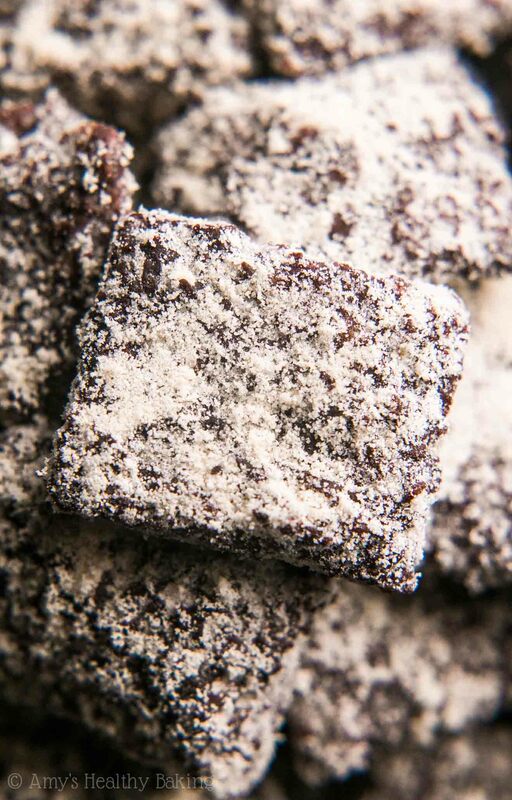 Also called muddy buddies, this healthier recipe for the sweet chocolate-covered cereal snack is absolutely irresistible! Leftovers will stay fresh and crunchy for at least 5 days if stored in an airtight container or zip-topped bag. Preheat the oven to 325°F, and lightly coat a 9”-square pan with nonstick cooking spray. Add the protein powder to a gallon-sized zip-topped bag, and set aside. Add the cereal to a large bowl, and set aside. In a small bowl, whisk together the cornstarch and 1 tablespoon of milk. Add the remaining milk and peanut flour to a small pot, and whisk until thoroughly combined. Cook the mixture over medium-low heat, stirring frequently with a spatula, until it begins to simmer, about 3-4 minutes. Reduce the heat to low, and briefly whisk the cornstarch slurry to recombine the mixture. Slowly add the cornstarch slurry to the pot, stirring constantly to avoid clumping. Once the slurry has been fully incorporated, remove the pot from the heat, and add in the melted chocolate. Return the pot to the heat, and continue stirring constantly until the melted chocolate is fully incorporated and the mixture reaches the consistency of pudding. Pour the chocolate mixture over the cereal, and gently toss with the spatula until all of the cereal has been coated. Transfer the cereal mixture to the prepared pan. Bake at 325°F for 30 minutes, gently stirring halfway through. 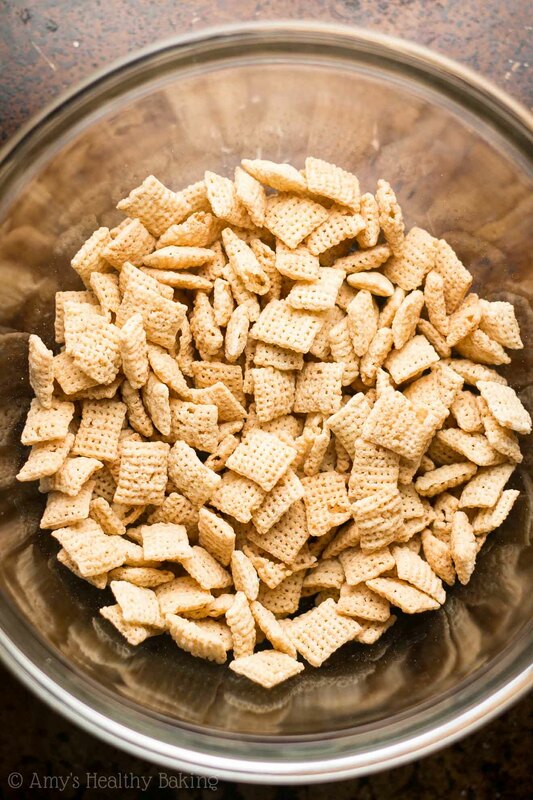 Let the cereal cool for 3 minutes before breaking apart any clumps. Return the pan to the oven for an addition 15 minutes or until all of the cereal is crunchy. Cool in the pan for 3 minutes before pouring into the zip-topped bag with protein powder. Seal the bag, and gently shake until all of the cereal is coated. Open the bag, and let the cereal cool completely. Notes: I have only tried this recipe with this protein powder. 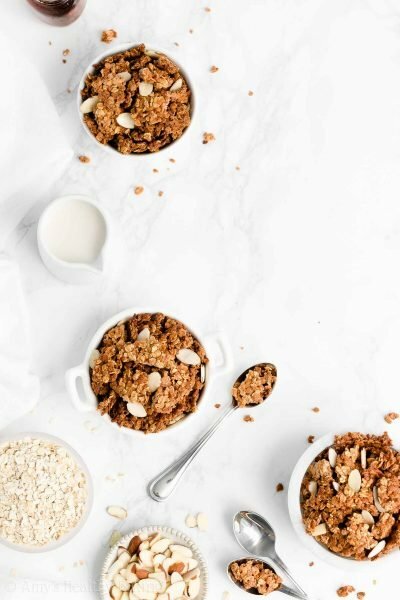 Many vanilla protein powders should work, both whey-based and plant-based, but they may not adhere to the cereal as well. For more information, see my Protein Powder Recipes: Tips & FAQ Page. Any cow’s milk, soy milk, and cashew milk may be substituted for the nonfat milk. Do not use almond milk; it does not thicken very well when combined with cornstarch. For the best results, the only ingredient in the peanut flour should be peanuts (and potentially salt). This is the brand that I prefer. Regular creamy peanut butter may be substituted, but the Nutrition Information will change. I prefer 72% dark chocolate bars (or darker). Dark chocolate chips may be substituted. I haven’t seen Zootopia yet, but I would really like to. I look forward to when it comes out on Amazon! Substituting peanut flour for powdered sugar is so creative. 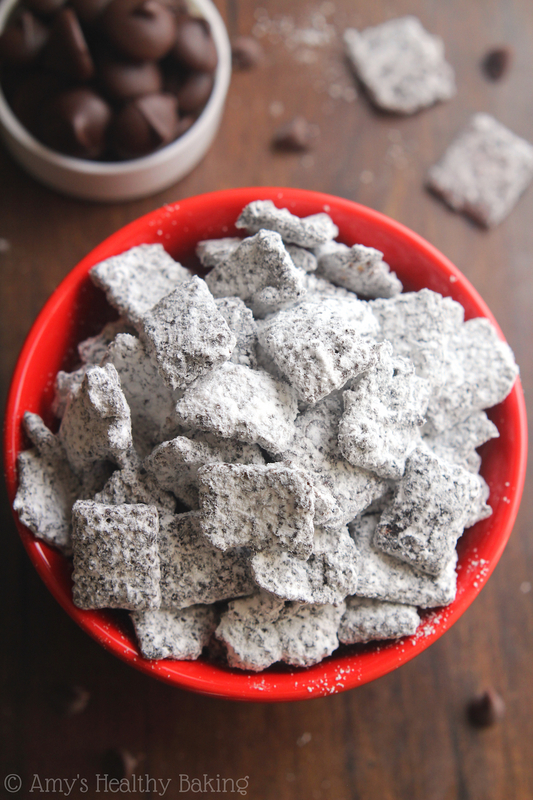 I’m always super impressed by the healthy substitutions you come up with, and this puppy chow looks so yummy. Thank you so much Elaine!! 🙂 I hope you enjoy the movie when it comes out later this year! Thanks Liz! I’d actually recommend omitting the peanut flour and simply adding another tablespoon of dark chocolate instead. 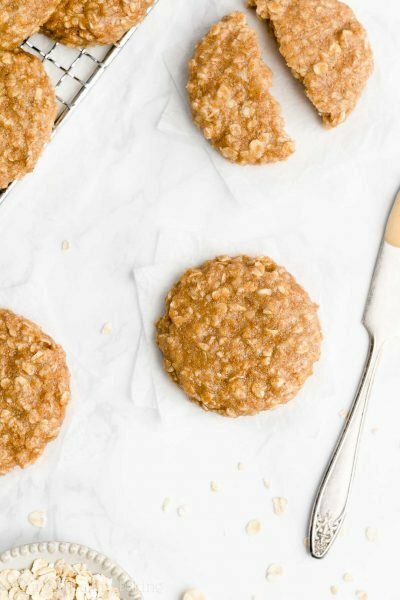 Almond flour has a much more subtle flavor than peanut flour, so you wouldn’t be able to taste it. We have peanut allergies in my family too, so I can understand! 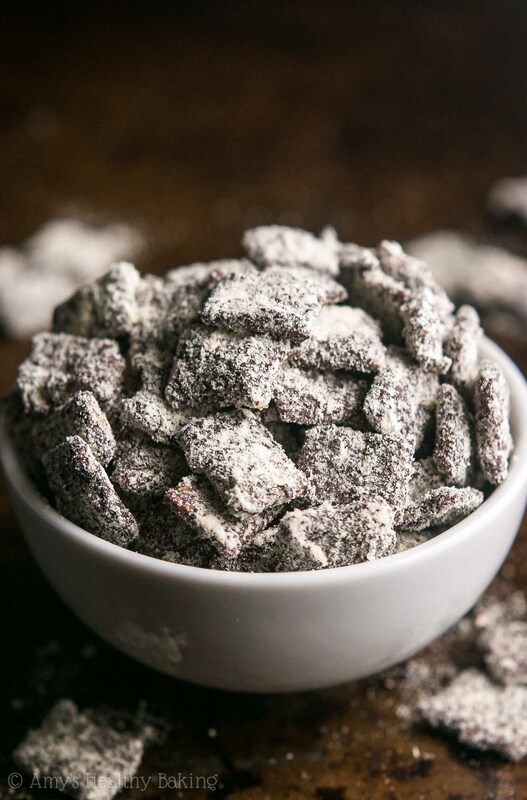 🙂 I’d love to hear what you think of the puppy chow when you try it! Thank you Amy! That seems very doable. I think I will try making it this weekend ? Hi Amy! I just made the puppy chow. It’s really good and was easy to make. It will make a great snack for work ? Hey Amy! Just to double check, would Silk Unsweetened Vanilla Cashew Milk work? Can’t wait to make it! Yes! Silk’s cashew milk will definite work. 🙂 I can’t wait to hear what you think of the puppy chow Erin! Oh my, this is genius! 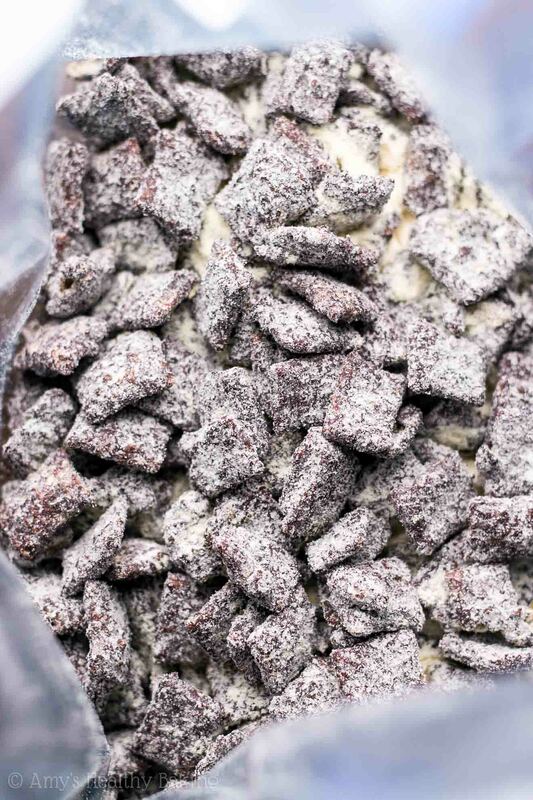 Protein puppy chow? This is AMZING! I have sooooo much protein powder in my kitchen right now just waiting to be used up! Sounds like it was completely meant to be Bethany! 😉 I can’t wait to hear what you think of the puppy chow! LOVE your recipes!! Thank you for spending time so we all benefit. Yes, PB2 should work Gina! And I totally consider both PB and chocolate their own food groups too. I need them both on a daily basis! 😉 I’m excited to hear what you think of the puppy chow! I saw your comment about almond milk, but that is all i keep in the house, so i tried a different thickening agent. I used arrowroot flour and the almond milk thickened perfectly. Thanks for letting me know JD! I’m so glad to hear that! 🙂 I hope you enjoyed the puppy chow! Oh goodness, that’s a great question! I haven’t tried it… But I have a feeling it might work! 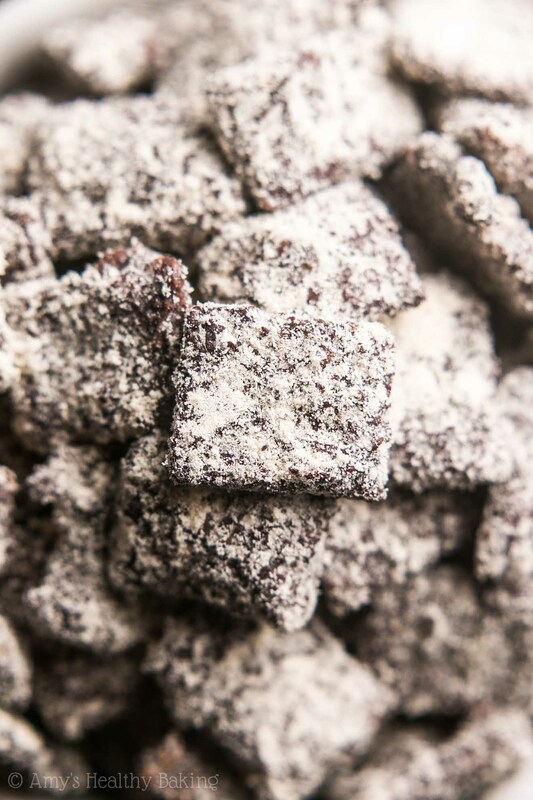 I’d recommend following the instructions for my slow cooker granola recipe since this puppy chow and my granola recipes are pretty similar in their oven baking methods. 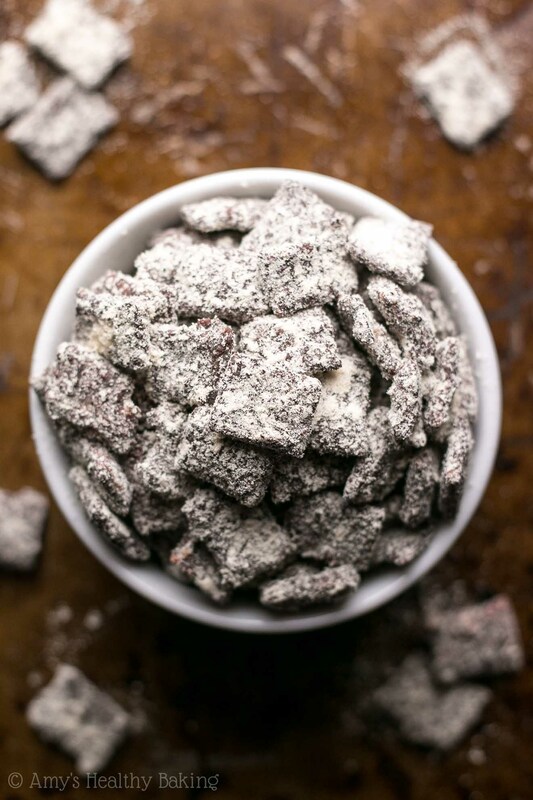 Try to break up the puppy chow clusters after each set of 45 minutes. 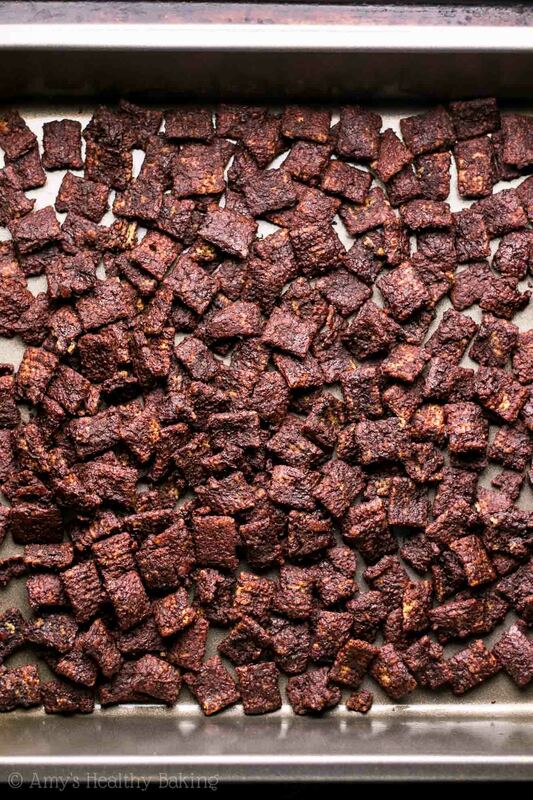 The “baking” time in the slow cooker may vary, but you’re looking for crunchy cereal pieces to know it’s done! 🙂 I can’t wait to hear how that works for you Monica!